Staples celebrates after sophomore Wyatt Fern scores the game-winning goal last Thursday in a 4-3 overtime victory over St. Bernard in the Division III quarterfinals. Heroes sometimes step to the forefront in playoff games, especially when the front-liners get neutralized. 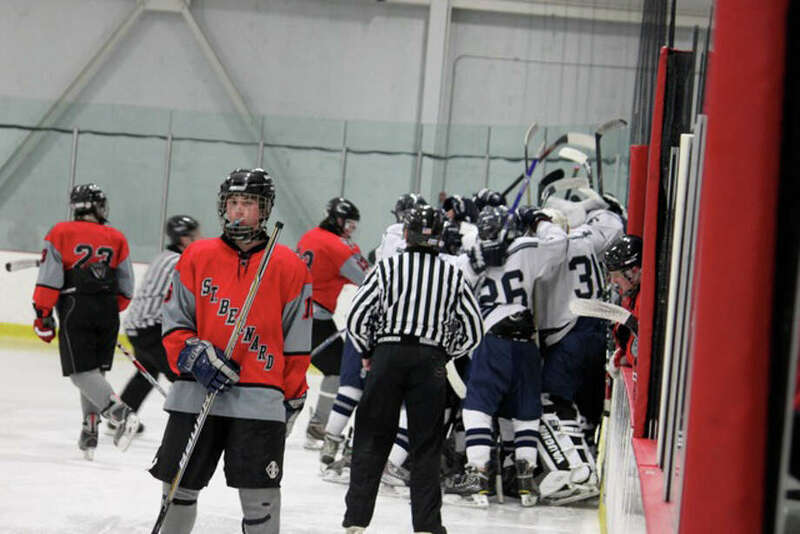 Enter Staples-Weston-Shelton boys hockey co-op team sophomore Wyatt Fern, who scored the biggest goal of his career last Thursday night to give Staples a 4-3 win over seventh-seeded St. Bernard-Bacon Academy-Norwich Free Academy in the Division III quarterfinals. "I didn't think I was going to be the hero, I just tried to keep it out of our end," Fern said. "There was a lot of pressure in overtime to keep the puck out of our end, and it was a big relief to see the puck in the net. It feels really good." Fern stole the puck with 13:11 remaining in overtime at the seventh-seeded St. Bernard's blue line and lifted a shot into the net. "One of their kids had it and messed around with it on the blue line," Fern said. "I just took it and walked in." Staples raised its record to 15-7 and played third-seeded Windsor-East Granby-Avon co-op team in the D-III semifinals yesterday after press time. The Saints finished their season at 13-9. "I told them not to panic and to use your speed and if you do, good things will happen," Wreckers Coach Ralph Unker said in reference to Fern's goal. Senior alternate captain goalie Luke Andriuk made some big saves late in the third period and at the beginning of overtime to preserve the tie for the Wreckers and gave them a chance to win it in the end. "I just tried to keep my head in it," Andriuk said. "I've been defeating myself in my head and I tried to clear my head after allowing a goal." St. Bernard controlled play in overtime and looked like it was heading towards springing an upset before Fern made the game-changing play. What made this a surprise for Staples was the fact the Saints barely beat Norwalk, 4-3 and lost 8-2 to the Fairfield co-op team. The Wreckers beat Norwalk 7-3 and lost 6-4 in an upset to Fairfield. But then again, as Staples showed against Fairfield, no one should be too surprised when it struggles against teams it's heavily favored to beat. Conversely, the Wreckers play better against stronger teams as illustrated in their 3-2 upset win at Division I Greenwich, 3-0 victory at D-I Trinity Catholic and seven victories over D-II opponents. Although Staples lost 3-2 in overtime to D-I Darien, it played better in defeat to the Blue Wave than it did in victory over St. Bernard. "We were sluggish and sloppy today and were selfish with the puck," Unker said. "We lacked energy and didn't play the way we were capable of. We weren't pumped up for the game. The kids looked at their previous results and you can't do it in the state tournament. We didn't play Wrecker hockey and we feel very fortunate to get the win and move on to the next round." Andriuk said, "It's basically all about how the game is played. Against Greenwich, I saw a lot of direct shots. Today [against St. Bernard], I faced a lot of screened shots. We knew what those teams [Greenwich and Darien] were about and inspired us to play at their level. We don't know what team's like St. Bernard's is like and the unfamiliarity contributed to the lack of a stellar performance. We played down to the level of our opponent." Illnesses may have played a role in the Wreckers' performance. Senior captains Tali Laifer and Dan Guerrera and junior captain Kyle Wehmhoff all had the flu recently and Laifer wasn't completely recovered. "Tali played sick tonight," Unker said. St. Bernard controlled the first seven minutes of the game and outshot Staples 12-7 in the first period. Overall, the Wreckers had a 34-28 shots on goal advantage. Andriuk (25 saves) kept Staples in the game in the first period with some big saves. Junior Blake Biancamano gave the Saints a 1-0 lead in the first period with 7:27 remaining off a feed from classmate Sean Hurley. Two minutes later, Wehmhoff tied it and scored the only goal from the top line (Laifer and junior captain Aaron Liu is on the line). Laifer and Guerrera assisted on the goal. The Wreckers took a 2-1 lead with 5:17 left on freshman Sean Stewart's shot from Fern and junior Forrest Savage. While the first line struggled, the second line carried Staples. Fern fired a shot off a faceoff that St. Bernard senior goalie Dan Berry (30 saves) saved but Savage poked in the rebound from point-blank range to make it 3-1 with 13:59 to go in the second period. "If my line shows up, we'll put it in the net," Fern said. However, the lead wasn't secure. Senior James Stowe flicked in a shot from Hurley with 8:50 left to make it 3-2 and sophomore Joey Mitchell tied it 3-3 with 5:57 remaining when he put in the rebound after Andriuk stopped sophomore Denzel Dickerson's shot. The Saints had a chance to take the lead after gaining a two-man advantage but Andriuk made a few big saves, one coming off a blistering slap shot from junior Kenny Brooks. Liu had a bid for a shorthanded goal but Berry stopped him. Berry also made big saves on senior alternate captain Ben Brancucci and freshman Eric Zurmuehle. After an interference penalty on St. Bernard senior Billy Griffin with 1:26 to go in regulation, Fern had a chance to win it when he walked in on net, but unlike the overtime play, Berry made the save and had Fern wait a little longer for his heroics. "We kind of lowered our ability and they raised their ability and it evened out," Fern said. Andriuk said, "Three teammates [Jason Shapiro, Greg Keiser and Frankie Rende, Class '09] from two years ago come into the locker room between periods and gave us a pep talk and motivated us. They told us what it felt like to lose in the playoffs and it kept us focused on the game."